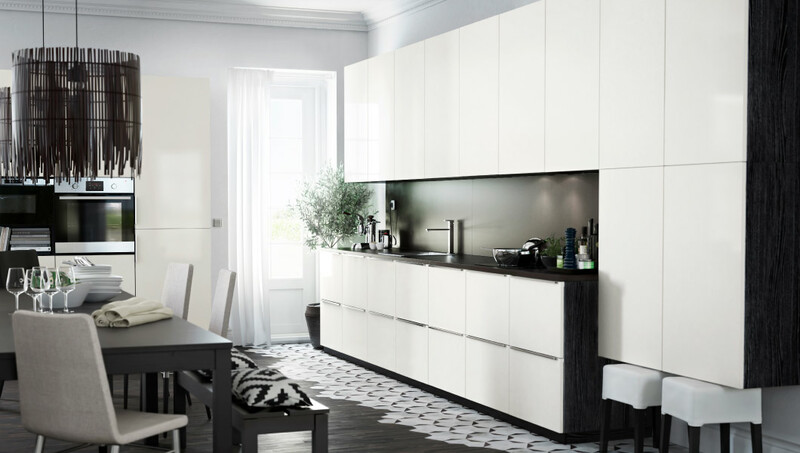 Modern Italian kitchens are famous for their clean, sophisticated looks – and expensive price tags. Look no further than IKEA to save you money for this look. The new SEKTION line has the flat door styles, integrated handles, and everything else you need for your Italian style kitchen design. We’ll share examples from IKEA’s European version of SEKTION, which is called METOD. First let’s look at cabinet doors and drawer fronts. Notice that the door fronts are flat, and that they fully overlay the cabinet frames. The wall grey cabinets you see across from the window and above the oven, are all METOD with VEDDINGE grey doors. The METOD drawers under the window also have grey VEDDINGE doors. The natural wood-looking drawers you see have HYTTAN fronts. Modern Italian kitchen design makes use of a lot of natural light, muted colors, and natural wood and materials. One of the hallmarks of Italian-style kitchens is integration. Or, as some Americans might think of it, camoflauge! Did you see the refrigerator in the previous picture? No? That’s because Italian kitchens conceal appliances. Or, as IKEA puts it, it’s a kitchen that “thinks it’s a living room.” Think about it: hanging out in your living room with your refrigerator seems pretty weird. The oven is completely surrounded by METOD cabinetry and TINGSYRD doors. The refrigerator is hidden in METOD refrigerator cabinet. Are you a fan of Italian kitchen design? We think SEKTION will offer more opportunities for this look than AKURUM does. What do you think? As dori si tu un preț si mai multe detalii. Va multumesc!